RAPID CITY, S.D. — A South Dakota man bid $89,000 at an auction to win a chance to hunt bighorn sheep in the Black Hills. 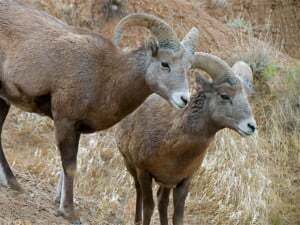 The Rapid City Journal reports that it’s the seventh consecutive year the state wildlife officials have auctioned off the tag to help raise funds for bighorn sheep research and development. Game, Fish & Parks regional supervisor John Kanta says the event has raised an average of $83,000 a year. The first year the tag was offered, in 2013, it was sold to a Watertown businessman for $103,000. Officials aren’t releasing the name of the winner until the license is issued. Kanta said the person who wins the auction can select who gets the tag and Kanta said this year’s top bidder may issue it to his son. Last year, the largest hunter-killed bighorn sheep with both Pope and Young Club and Boone and Crockett Club was taken by a bowhunter in the South Dakota Badlands. With a final score of 209-1/8 inches, it surpassed the previous world record Rocky Mountain ram by almost 10 inches.